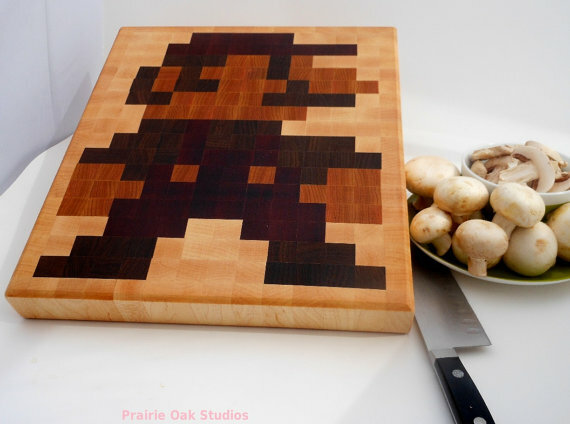 Looking for a great quality wood cutting board, but don’t want it to look like everyone else’s? Prairie Oak Studios can help you out. Their boards include 8-bit renditions of Mario and Nyan cat, or just simply beautiful designs. They feature this quote on their site: “Have nothing in your homes that you do not know to be useful or believe to be beautiful.” -William Morris. With these cutting boards, you’ll get a great product that will also make you smile every time you use it. Can’t beat that! Cutting boards: $59-110 at Etsy.com. I love this cutting board sooooo much! The first Etsy treasury I ever made was based on this cutting board! Pixel art rules!